My husband Lulu planted a sweet cherry tree 6 years ago and it didn't produce much fruit until 2-3 years ago. At first, we only planted one tree. The next year, we learned that we needed to plant another tree nearby to help pollination. What we didn't know at the time was that they shouldn't be next to each other to form fruit but instead, they should be spaced out to ensure they didn't damage each other. 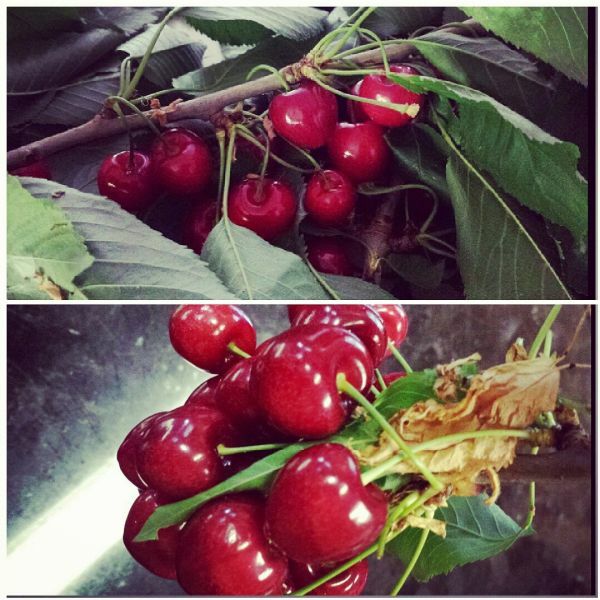 Finally, with the help of Lulu's friend who holds a master's degree in horticulture told us sweet cherry trees should be planted within flying distance of the pollinizers. This year the crop is so huge that each branch holds at least 2 dozen cherries. We've been asking friends and family to take some home, but we still have more, so I pair them with everything, just as I did earlier with peaches. Of course, we eat them non-stop but I also manage to cook with them. Cherries are one of the healthiest foods to eat, so why not take advantage! I've gathered 15 cherry recipes to share with you. I especially like cherries with poultry. The cherries from the farmers' market this week weren't very sweet, so I used them in a savory dish and paired them with my specialty, rotisserie chicken. I marinated the poultry overnight in a flavorful, buttery mixture and roasted the meat the following day. 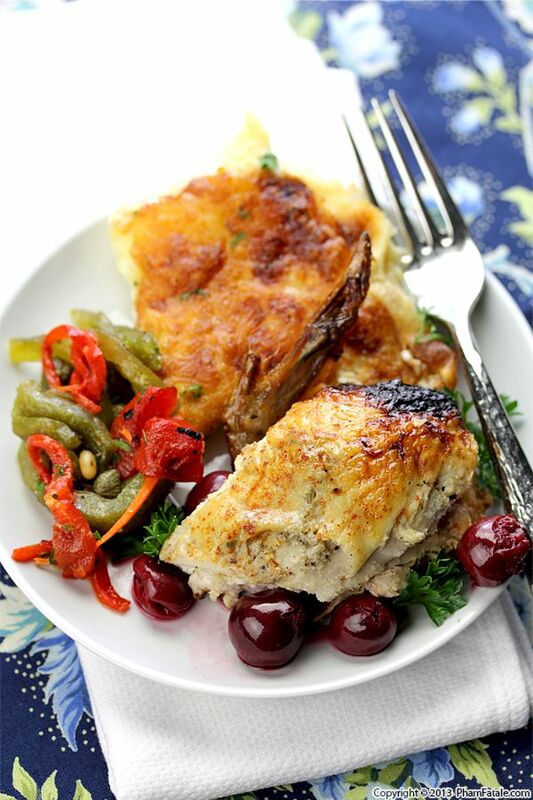 Once the chicken was fully cooked, I used the pan drippings and poached the pitted cherries until softened. 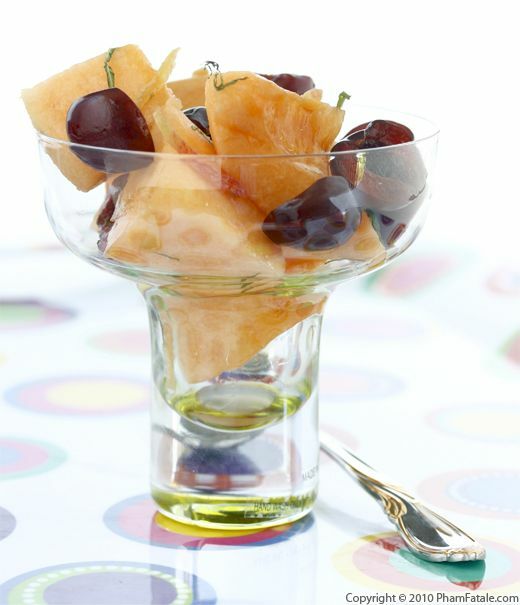 This method is my way to make good use of fruit that can't be eaten as is or in dessert. Next time you're a bit disappointed with the groceries you bring home, think twice before wasting them; there's almost always a clever way to turn an item into a delicious dish and no one will ever suspect the reason you decided to go this route! After posting recipes for almost 5 years, I realized I had never paid homage to the most famous French pastry: le macaron. Today is my attempt to correct this oversight. 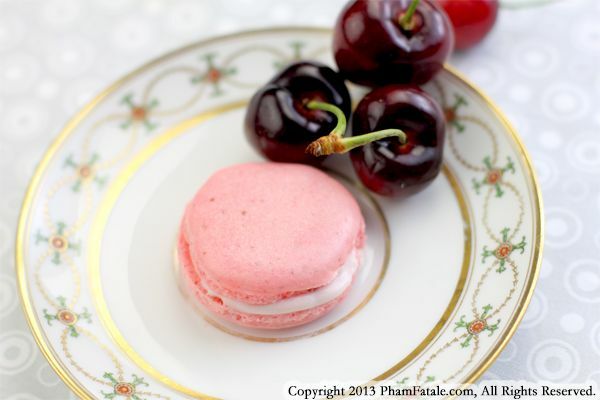 I made cherry-flavored macarons since this delicious red fruit is finally available in the market. Making this delicate confection is very time-consuming but so rewarding. I'm not as good at it as I would love to be. They really should rise a bit more in volume, but the meringue still looks decent and the taste is there. The elements of the macaron are egg whites, powdered sugar, granulated sugar, almond flour and a bit food coloring. This assembly is also tricky as the shells can be crushed very easily. I simply add a small mound of cherry-flavored white chocolate ganache and then holding them by the base of the cookie, gently press the two shells together against each other to form the beautiful sandwich cookie. I mentioned recently that my husband Lulu surprised me with a celebratory trip to the Napa Valley. We felt it was well deserved after completing the manuscript of my first cookbook (available for pre-order). We stayed at the Vintage Inn. We've been there before and we've never been disappointed. The hotel is located in the heart of Yountville, within 3 blocks of what seems like the highest concentration of Michelin Star Restaurants in the world. The service was exquisite as usual with complimentary champagne breakfast buffet daily and a lovely afternoon tea service to boot. It's by far the best hotel breakfast I've ever had, ranging from petite pastries, freshly-made omelets, goat cheese walnut puffs and chocolate tartlets. What truly caught my attention was the delicious almond tart with seasonal fruit. I couldn't resist making the same dessert today to remind us of our trip, and as a huge thank you to Lulu for such a fabulous, memorable vacation. Of course, the restaurants were out of this world and the scenery was beautiful; but the highlight of the trip was relaxing with my husband and baby at this lovely hotel. If you visit Yountville, without a doubt, stay at the Vintage Inn! 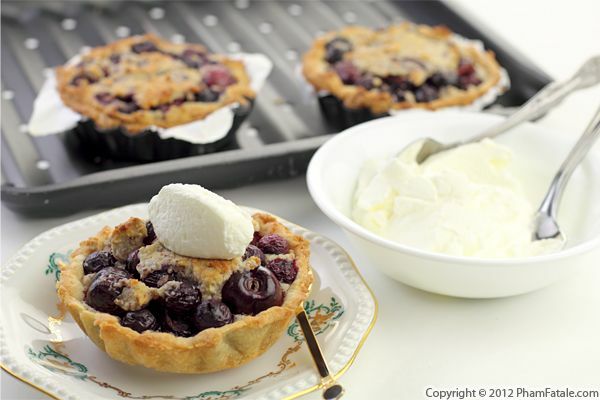 The tart is made with a dense, almond filling and a large quantity of fresh cherries and blueberries. I made the crust with powdered sugar, toasted rice flour and regular all-purpose flour. The result is a wonderful fruit tart oozing with sweet fruits and a crunchy crust. We're hitting the very end of cherry season in California. I made a fruit salad combining cherries and sweet cantaloupe. Once pitted and sliced, I let the fruits macerate in cardamom and ginger-flavored maple syrup until the juices begin to flow. I also spiced the fruit salad with thinly sliced candied ginger to accentuate the flavor. This is a quick and easy dessert recipe that celebrates the end of the summer. There's probably a week or two left to enjoy cherries; otherwise you'll have to wait till next year or hit the frozen aisle of your market.